Not even a recipe, just a technique. For some reason, my dad thought it was really important to show this technique as a separate post. I didn’t invent it–people have been doing it for years now. But here’s the technique and some of the history about it. 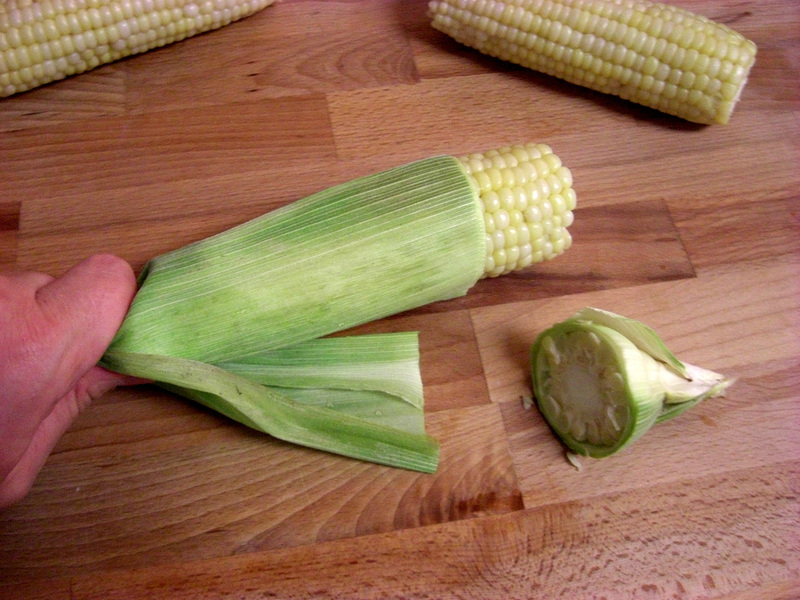 Whenever you go to the grocery store during the summer, there’s a big bin of corn and a smaller bin for you to throw the husks and silk, so you don’t bring them into your kitchen and have them get everywhere. At the store near me, there’s usually a collection of miserable-looking twenty-somethings hunched over the bin in shorts and flip-flops, usually getting as much cornsilk on themselves as they get into the bin. Have you ever given any thought to how restaurants prepared steamed corn on the cob, back when restaurants did that themselves? Have you ever given any thought to how restaurants prepared steamed corn on the cob, back when restaurants did that themselves? Do you think there was a big bin out back with a group of self-interested douchebags in beachwear tugging at the cornsilk (not a euphemism) like there is at the grocery store? No, of course not. They would steam the corn right in the husk, then slice off the bottom and squeeze the cob out of the husk from the stem end. So at some point, some enterprising home cook thought to prepare corn in smaller batches in the same way: steaming it, but this time, in the microwave, with the moisture in its own husk. Once the end is removed, the corn slides out (with some cajoling). 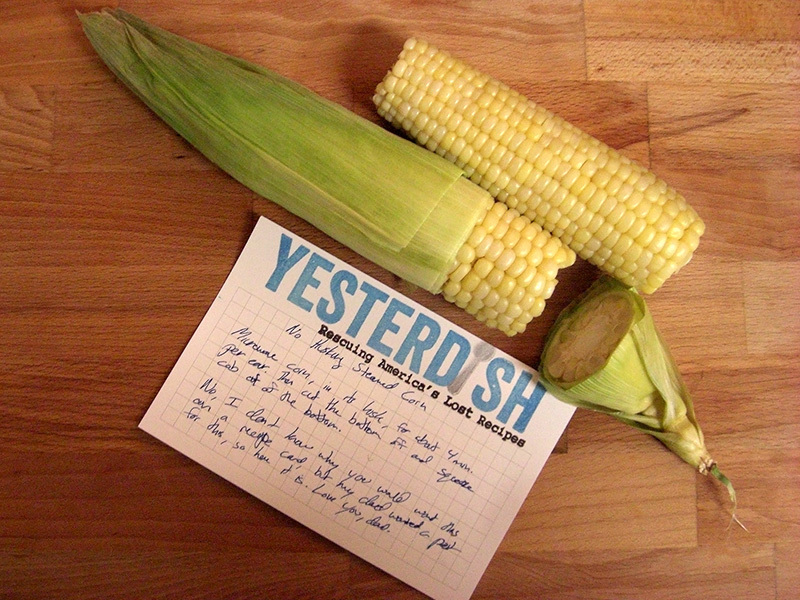 If you’re going to eat your corn on the cob, you’re done. 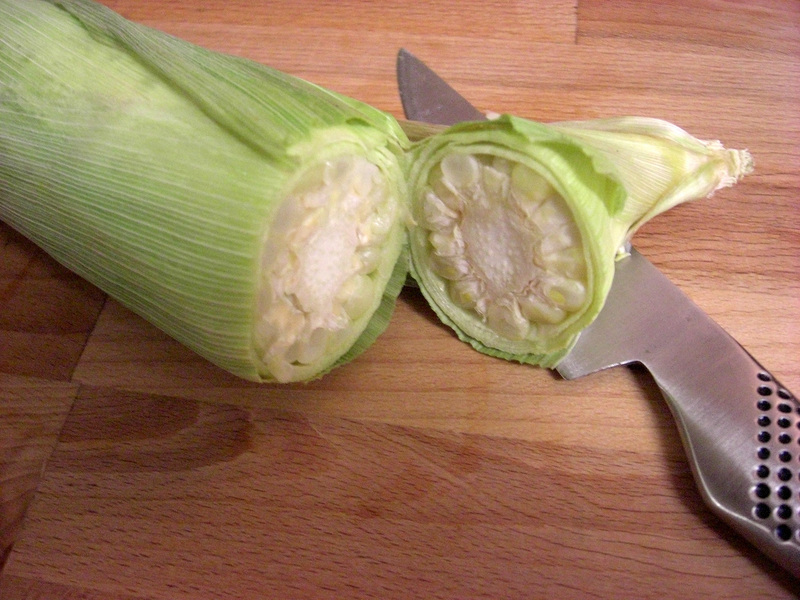 If you’re going to cut it off the cob for a recipe (not-so-hypothetically, in this case), you want to be sure that after you cut the kernels off, you turn the knife around and scrape anything left out of the cob. The bottom of the corn kernel is the germ, which is the most flavorful part. 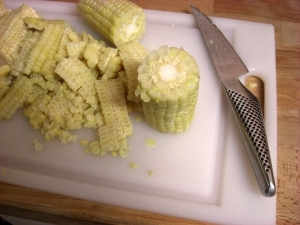 At home, my dad prefers his corn cut off the cob; my mom has agreed to cut his corn off the cob for him, provided the parts left over are for her. I’ve explained to him that he’s surrendering the best part of the corn, but he’s not interested in changing this balance. Whether that’s due to a preference for the top of the kernel or a desire to avoid upsetting the delicate balance of the domestic ecosystem is a question beyond the scope of this little recipe card. 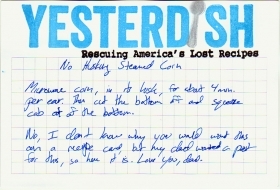 Microwave corn, in its husk, for about 4 minutes per ear. 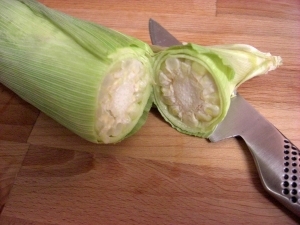 Then cut the bottom off and squeeze cob out of the bottom. 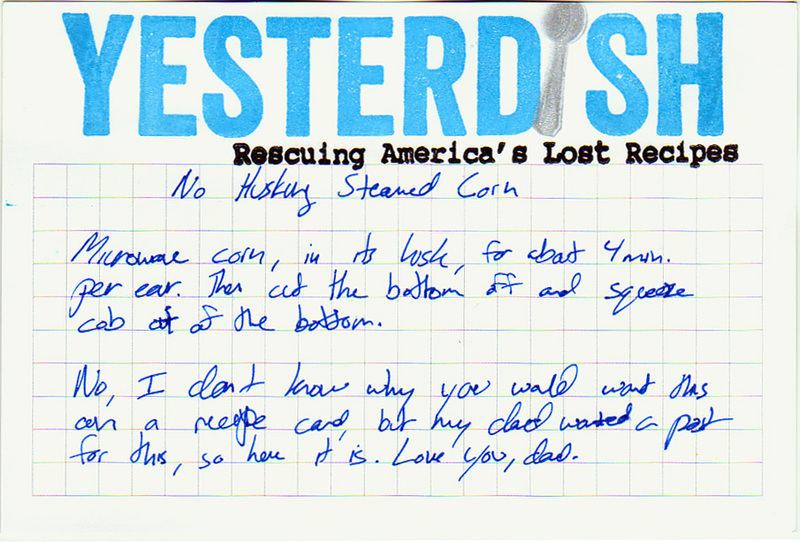 No, I don’t know why you would want this on a recipe card, but my dad wanted a post for this, so here it is. Love you, dad. With wine, cloves and oranges. From the box of C.C. from Ceres, California.